Salty, peanut buttery, chocolatey – this dessert has it all. It’s a lovely bark, perfect for sharing and enjoying with friends. And it’s easy with just 5 ingredients. Like sometimes I dip a spoon into the jar and eat it because I love it so much. 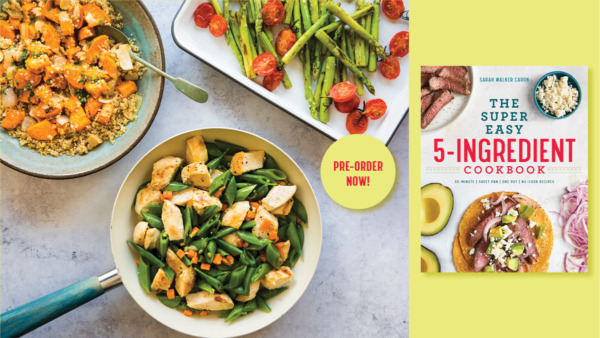 So when I was planning recipes for the dessert chapter in my new cookbook, The Super Easy 5-Ingredient Cookbook (which, OMG, comes out in just over a week on Sept. 18! ), peanut butter had to be included. The recipes include a pudding, a milkshake and this recipe, my absolute favorite. 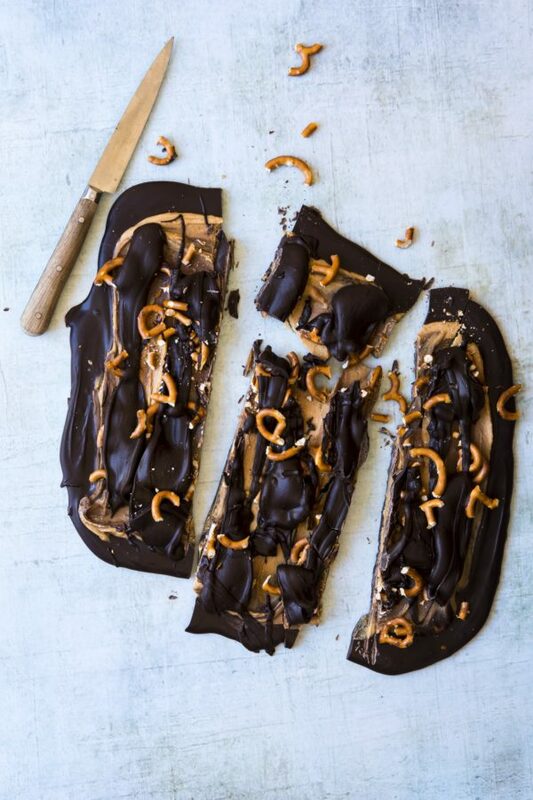 Chocolate Peanut Butter Pretzel Bark is pure delight. Melted dark chocolate is spread out and then topped with a peanut butter mixture that is like the filling of a peanut butter cup. And then it’s topped with more chocolate and crumbled, salty pretzels. Ah-Maze-Ing. Keep this chilled. Though it’s not perishable, it’s better with the harder consistency that comes with chilling. Use a peanut butter you love. Actually, follow this rule for every ingredient you use in any recipe. Good ingredients make good dishes. Salty, thin pretzels work best. Maximize your salt and pretzel to chocolate and peanut butter ratio! 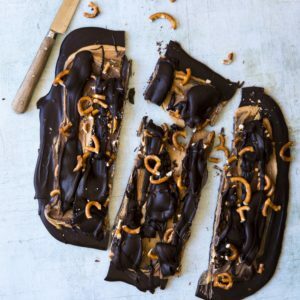 Rich chocolate, creamy peanut butter filling, salty pretzels. What more could you ask for in a dessert? In a small bowl, stir together the peanut butter, powdered sugar and butter until smooth. Melt the dark chocolate. There are two methods you can use: 1: Place the chocolate chips in a glass, microwave-safe bowl and cook for 30 seconds, stir and repeat until smooth. 2: Place a metal mixing bowl on top of a small saucepan with water in the bottom (don't let the water touch the bowl). Heat the water to bowling with the chocolate chips in the mixing bowl, stirring constantly, until smooth. Place waxed paper on a baking sheet. Spread half of the chocolate onto the baking sheet. Top with the peanut butter mixture and pretzels followed by the other half of the chocolate. Chill in the refrigerator. Allow to harden completely before cutting into pieces. I substituted chunky peanut butter for one more layer of texture and nuttiness. Oooh! Great idea! I love the filling to be creamy (reminds me of a truffle) but I can imagine how tasty a chunky version could be too. Peanut butter, dark chocolate and pretzels! Yes please! Can’t wait to make!! Congrats on the new cookbook! It looks fabulous! And this Pretzel Bark is genius! I love to make gifts for the holidays and this would be perfect! I’m not a peanut butter person, but I love the peanut stuffed pretzels from Trader Joe’s, so this peaks my interest! I love anything sweet and salty! This looks delicious!